Surfboards are available in all shapes and sizes. But for the most part, surfboards fall into one of a few the four primary types of surfboard designs. These groups distinguish the types of surfboards by their basic shape and how they are best ridden. 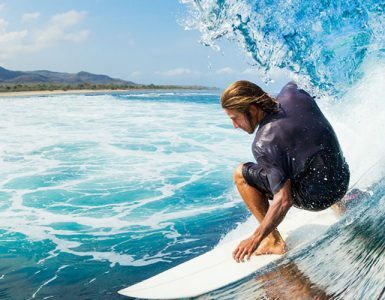 The most common types of surfboards today include the: shortboard, longboard, fish and gun. The first board that I wanted to mention is the shortboard, also known as the thruster. This surfboard design allows surfers to push the boundaries of the sport. It's a board used to perform quick maneuvers on waves and is the most popular type of surfboard design. The size of shortboards is generally from around 5'8'' to 6'10''. It will have a greater amount of rocker which allows it to surf in critical sections of the wave. It is most commonly seen with sharp noses, thins rails, and either three or four fins. The next type of board is the longboard or malibu (mal). This is the oldest and most traditional of modern surfboard designs. One main difference in design is that the nose of the longboard is rounded. Longboards typically range from 8 feet to 12 feet long, are at least 2.5 inches thick and twenty inches wide. This extra volume allows them to paddle incredibly well and catch waves with ease. A beginner should start on a longboard shape to learn wave selection, paddling technique, and turning basics. Longboarders are known for their smooth style, surfing in a very fluid manner. The fish is the next type of board that we'll look at. The fish design gained popularity in the 1970s and has origins in the knee-board. It is typically shorter and wider than the shortboard and because of this it works very well in small mushy surf. A fish is a relatively flat surfboard with only a bit of rocker, allowing it to paddle very well and carry speed through flat sections of a wave. Fish are generally between 4'8'' and 6'0''. The gun is a bigger version of the shortboard and is used in the big wave arena. The increased length of the board makes it possible to paddle into bigger waves. The gun can be anywhere from 7'2'' in length to over 12' for the really big waves. The extra length allows a surfer to gain enough speed while paddling to catch the huge and fast moving waves. It is designed for big drops and handling very high speeds with good control. A gun will have a great deal of rocker and will most likely have three of four fins. The basic rule to remember for your beginner board is the bigger, the better. A bigger surfboard will offer more flotation and stability which will assist you in paddling, catching waves, standing and surfing. As a general guide, if there is no experienced person to offer assistance when purchasing your surfboard, put one arm straight up into the air and the length of your beginner board should approximately reach the tips of your fingers. There are parts to the surfboard that you will have to know to help you with your surfing. The more rounded or pointed end is known as the nose. The opposite end is known as the tail, this is the end where your feet go when lying on the surfboard. The sides of the surfboard are the rails, the rails are used for turning the surfboard, but at this stage you should use them for holding on. The top side is the deck, this is the side you lie and stand on. The bottom is simply called, the bottom. The leg rope not seen in diagram is what attaches you to the surfboard, it is a velcro strap that goes around your back ankle when standing. It is located at the tail. Surfboard Wax is applied to the deck to add grip, alternatively your surfboard may have deck grip stuck to it.